Earlier this week, I shared my version of the restaurant entree, Chicken Tender Salad. When I serve this to a group, I put a variety of salad dressings on the table. When I serve it to my family, I only put one dressing on the table. Not just any dressing, but a made from scratch honey mustard dressing. Honey mustard dressing, as the name implies, is made from honey and mustard plus additional ingredients. 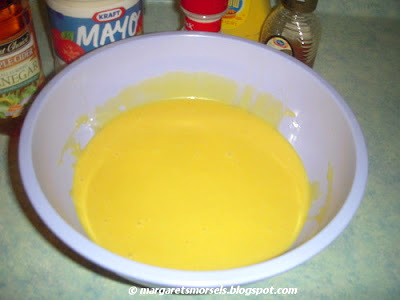 Some recipes use Dijon mustard which contains white wine while others use prepared mustard. 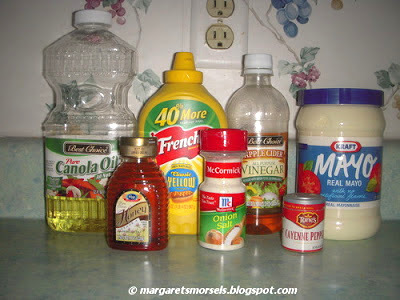 Some recipes use sour cream to make the dressing creamy while others use mayonnaise. In addition to honey and mustard, the recipe I'm sharing also uses vegetable oil, mayonnaise, cider vinegar, onion salt and cayenne pepper. The last two ingredients -- onion salt and cayenne pepper -- call for a dash and pinch respectively. When a recipe calls for a dash and the spice jar has a lid with holes, I gently tap the jar two times for a dash. I only tap the jar one time for a pinch. If you're afraid too much will come out, tap the jar over a bowl or a piece of wax paper and add the desired amount to the mixture. If your jar doesn't have holes in the lid, a good rule of thumb is a pinch is approximately 1/16 teaspoon; a dash, 1/8 teaspoon. 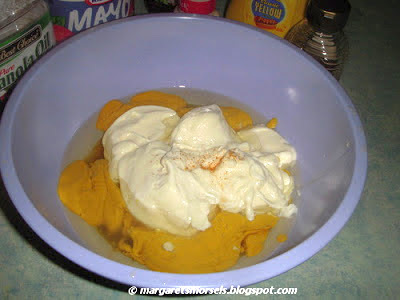 Thoroughly combine the ingredients and store in a covered container in the refrigerator. 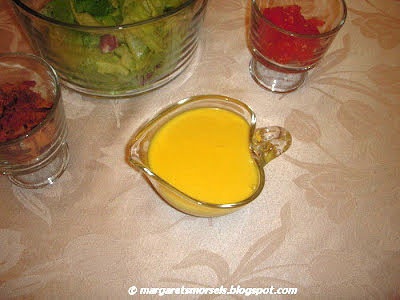 The dressing is best made one day ahead so the flavors have time to blend. The dressing is delicious on salads, but it's also good with chicken nuggets, fries and club sandwiches. My son likes to spread it on a turkey sandwich and my husband uses it as a dip for carrots. No matter how you choose to use it, it's better than store bought. Mix ingredients thoroughly. Cover and store in the refrigerator.